Adult respiratory distress syndrome (ARDS), also called acute respiratory distress syndrome, is a type of lung (pulmonary) failure that may result from any disease that causes large amounts of fluid to collect in the lungs. ARDS is not itself a specific disease, but a syndrome, a group of symptoms and signs that make up one of the most important forms of lung or respiratory failure. It can develop quite suddenly in persons whose lungs have been perfectly normal. Very often ARDS is a true medical emergency. The basic fault is a breakdown of the barrier, or membrane, that normally keeps fluid from leaking out of the small blood vessels of the lung into the breathing sacs (the alveoli). Another name for ARDS is shock lung. Its formal name is misleading, because children, as well as adults, may be affected. In the lungs the smallest blood vessels, or capillaries, make contact with the alveoli, tiny air sacs at the tips of the smallest breathing tubes (the bronchi). This is the all-important site where oxygen passes from air that is inhaled to the blood, which carries it to all parts of the body. Any form of lung injury that damages this point of contact, called the alveolo-capillary junction, will allow blood and tissue fluid to leak into the alveoli, eventually filling them so that air cannot enter. The result is the type of breathing distress called ARDS. ARDS is one of the major causes of excess fluid in the lungs, the other being heart failure. Along with fluid there is a marked increase in inflamed cells in the lungs. There also is debris left over from damaged lung cells, and fibrin, a semisolid material derived from blood in the tissues. Typically these materials join together with large molecules in the blood (proteins), to form hyaline membranes. (These membranes are very prominent in premature infants who develop respiratory distress syndrome; it is often called hyaline membrane disease.) If ARDS is very severe or lasts a long time, the lungs do not heal, but rather become scarred, a process known as fibrosis. The lack of a normal amount of oxygen causes the blood vessels of the lung to become narrower, and in time they, too, may become scarred and filled with clotted blood. The lungs as a whole become very "stiff," and it becomes much harder for the patient to breathe. Alveoli — The tiny air sacs at the ends of the breathing tubes of the lung where oxygen normally is taken up by the capillaries to enter the circulation. Aspiration — The process in which solid food, liquids, or secretions that normally are swallowed are, instead, breathed into the lungs. Capillaries — The smallest arteries which, in the lung, are located next to the alveoli so that they can pick up oxygen from inhaled air. Face mask — The simplest way of delivering a high level of oxygen to patients with ARDS or other low-oxygen conditions. Steroids — A class of drugs resembling normal body substances that often help control inflammation in the body tissues. Ventilator — A mechanical device that can take over the work of breathing for a patient whose lungs are injured or are starting to heal. Breathing in (aspiration) of the stomach contents when regurgitated, or salt water or fresh water from nearly drowning. Inhaling smoke, as in a fire; toxic materials in the air, such as ammonia or hydrocarbons; or too much oxygen, which itself can injure the lungs. Infection by a virus or bacterium, or sepsis, a widespread infection that gets into the blood. Massive trauma, with severe injury to any part of the body. Shock with persistently low blood pressure may not in itself cause ARDS, but it can be an important factor. A blood clotting disorder called disseminated intravascular coagulation, in which blood clots form in vessels throughout the body, including the lungs. 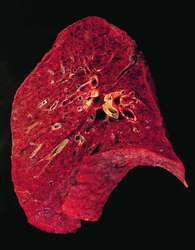 A large amount of fat entering the circulation and traveling to the lungs, where it lodges in small blood vessels, injuring the cells lining the vessel walls. An overdose of a narcotic drug, a sedative, or, rarely, aspirin. Inflammation of the pancreas (pancreatitis), when blood proteins, called enzymes, pass to the lungs and injure lung cells. Injury of the brain, or bleeding into the brain, from any cause may be a factor in ARDS for reasons that are not clear. Convulsions also may cause some cases. Usually ARDS develops within one to two days of the original illness or injury. The person begins to take rapid but shallow breaths. The doctor who listens to the patient's chest with a stethoscope may hear "crackling" or wheezing sounds. The low blood oxygen content may cause the skin to appear mottled or even blue. As fluid continues to fill the breathing sacs, the patient may have great trouble breathing, take very rapid breaths, and gasp for air. A simple test using a device applied to the ear will show whether the blood is carrying too little oxygen, and this can be confirmed by analyzing blood taken from an artery. The chest x ray may be normal in the early stages, but, in a short time, fluid will be seen where it does not belong. The two lungs are about equally affected. A heart of normal size indicates that the problem actually is ARDS and not heart failure. Another way a physician can distinguish between these two possibilities is to place a catheter into a vein and advance it into the main artery of the lung. In this way, the pressure within the pulmonary capillaries can be measured. Pressure within the pulmonary capillaries is elevated in heart failure, but normal in ARDS. To treat whatever injury or disease has caused ARDS. Examples are: to treat septic infection with the proper antibiotics, and to reduce the level of oxygen therapy if ARDS has resulted from a toxic level of oxygen. To control the process in the lungs that allows fluid to leak out of the blood vessels. At present there is no certain way to achieve this. Certain steroid hormones have been tried because they can combat inflammation, but the actual results have been disappointing. To make sure the patient gets enough oxygen until the lung injury has had time to heal. If oxygen delivered by a face mask is not enough, the patient is placed on a ventilator, which takes over breathing, and, through a tube placed in the nose or mouth (or an incision in the windpipe), forces oxygen into the lungs. This treatment must be closely supervised, and the pressure adjusted so that too much oxygen is not delivered. Patients with ARDS should be cared for in an intensive care unit, where experienced staff and all needed equipment are available. Enough fluid must be provided, by vein if necessary, to prevent dehydration. Also, the patient's nutritional state must be maintained, again by vein, if oral intake is not sufficient. If the patient's lung injury does not soon begin to heal, the lack of sufficient oxygen can injure other organs, such as the kidneys. There always is a risk that bacterial pneumonia will develop at some point. Without prompt treatment, as many as 90% of patients with ARDS can be expected to die. With modern treatment, however, about half of all patients will survive. Those who do live usually recover completely, with little or no long-term breathing difficulty. Lung scarring is a risk after a long period on a ventilator, but it may improve in the months after the patient is taken off ventilation. Whether a particular patient will recover depends to a great extent on whether the primary disease that caused ARDS to develop in the first place can be effectively treated. The only way to prevent ARDS is to avoid those diseases and harmful conditions that damage the lung. For instance, the danger of aspirating stomach contents into the lungs can be avoided by making sure a patient does not eat shortly before receiving general anesthesia. If a patient needs oxygen therapy, as low a level as possible should be given. Any form of lung infection, or infection anywhere in the body that gets into the blood, must be treated promptly to avoid the lung injury that causes ARDS. Smolley, Lawrence A., and Debra F. Bryse. Breathe RightNow: A Comprehensive Guide to Understanding and Treating the Most Common Breathing Disorders. New York: W. W. Norton & Co., 1998. National Respiratory Distress Syndrome Foundation. P.O. Box 723, Montgomeryville, PA 18936.
acute respiratory distress syndrome (adult respiratory distress syndrome) a group of symptoms accompanying fulminant pulmonary edema and resulting in acute respiratory failure; see also acute respiratory distress syndrome. 1. the health care profession providing, under qualified supervision, diagnostic evaluation, therapy, monitoring, and rehabilitation of patients with cardiopulmonary disorders; it also employs educational activities to support patients and their families and to promote cardiovascular health among the general public. 2. the care provided by members of this profession. 3. the diagnostic and therapeutic use of medical gases and their administering apparatus, environmental control systems, humidification, aerosols, medications, ventilatory support, bronchopulmonary drainage, pulmonary rehabilitation, cardiopulmonary resuscitation, and airway management. respiratory distress syndrome, neonatal (respiratory distress syndrome of the newborn (RDS)) a condition of the newborn marked by dyspnea with cyanosis, heralded by such prodromal signs as dilatation of the nares, grunting on exhalation, and retraction of the suprasternal notch or costal margins. It usually occurs in newborns who are preterm, have diabetic mothers, or were delivered by cesarean section; sometimes there is no apparent predisposing cause. This is the major cause of death in neonates and survivors have a high risk for chronic neurologic complications. No one factor is known to cause the condition; however, prematurity and interrupted development of the surfactant system is thought to be the major causative factor. Surfactant is secreted by the epithelial cells of the alveoli. It acts as a detergent, decreasing the surface tension of fluids that line the alveoli and bronchioles and allowing for uniform expansion of the lung and maintenance of lung expansion. When there is an inadequate amount of surfactant, a great deal of effort is required to re-expand the alveoli with air; thus the newborn must struggle for each breath. Insufficient expansion of the alveoli results in partial or complete collapse of the lung (atelectasis). This in turn produces hypoxemia and elevated serum carbon dioxide levels. The hypoxemia causes metabolic acidosis from increased production of lactic acid and respiratory acidosis due to the hypercapnia. The lowered pH constricts pulmonary blood vessels and inhibits intake of oxygen, thus producing more hypoxemia and interfering with the transport of substances necessary for the production of the sorely needed surfactant. Patient Care. In order to minimize the hazards of oxygen toxicity and retinopathy of prematurity, the blood gases of the newborn with respiratory distress syndrome must be carefully monitored to assess response to therapy. The goal is to administer only as much oxygen as is necessary to maintain an optimal level of oxygenation. To improve respiratory function, intubation, suctioning of the air passages, and continuous positive airway pressure via nasal prongs are commonly used, as well as instillation of artificial surfactant. Monitoring is conducted using transcutaneous oxygen monitoring or a pulse oximeter. To optimize breathing effort and facilitate air exchange, the newborn is positioned on the back with a shoulder support to keep the neck slightly extended, or on the side with the head supported. Because of the drying effect of oxygen therapy and the prohibition of oral fluids, mouth care must be given frequently to prevent drying and cracking of the lips and oral mucosa. respiratory failure a life-threatening condition in which respiratory function is inadequate to maintain the body's need for oxygen supply and carbon dioxide removal while at rest; it usually occurs when a patient with chronic airflow limitation develops an infection or otherwise suffers an additional strain on already seriously impaired respiratory functions. Inadequate or unsuccessful treatment of respiratory insufficiency from a variety of causes can lead to respiratory failure. Called also ventilatory failure. Early symptoms include dyspnea, wheezing, and apprehension; cyanosis is rarely present. As the condition worsens the patient becomes drowsy and mentally confused and may slip into a coma. blood gas analysis is an important tool in diagnosing respiratory failure and assessing effectiveness of treatment. The condition is a medical emergency that can rapidly progress to irreversible cardiopulmonary failure and death. Treatment is concerned with improving ventilation and oxygenation of tissues, restoring and maintaining fluid balance and acid-base balance, and stabilizing cardiac function. respiratory insufficiency a condition in which respiratory function is inadequate to meet the body's needs when increased physical activity places extra demands on it. Insufficiency occurs as a result of progressive degenerative changes in the alveolar structure and the capillary tissues in the pulmonary bed, as, for example, in chronic airflow limitation and pulmonary fibrosis. Treatment is essentially supportive and symptomatic. If the condition is not successfully managed it may progress to respiratory failure. respiratory therapist a health care professional skilled in the treatment and management of patients with respiratory problems, who administers respiratory care. The minimum educational requirement is an associate degree, providing knowledge of anatomy, physiology, pharmacology, and medicine sufficient to serve as a supervisor and consultant. Those registered by the National Board for Respiratory Therapy are designated Registered Respiratory Therapist (RRT). respiratory therapy technician a health care professional who has completed a specialized one- or two-year educational program and who performs routine care, management, and treatment of patients with respiratory problems under the supervision of a respiratory therapist. Such programs are usually found in community colleges and are accredited by the Joint Review Committee for Respiratory Therapy Education. acute lung injury from a variety of causes, characterized by interstitial or alveolar edema and hemorrhage as well as perivascular pulmonary edema associated with hyaline membrane formation, proliferation of collagen fibers, and swollen epithelium with increased pinocytosis. severe pulmonary congestion characterized by diffuse injury to alveolar-capillary membranes. Fulminating sepsis, especially when gram-negative bacteria are involved, is the most common cause. ARDS may occur after trauma; near-drowning; aspiration of gastric acid; paraquat ingestion; inhalation of corrosive chemicals, such as chlorine, ammonia, or phosgene; or the use of certain drugs, including barbiturates, chlordiazepoxide, heroin, methadone hydrochloride, propoxyphene hydrochloride, and salicylates. Other causes include diabetic ketoacidosis, fungal infections, high altitude, pancreatitis, tuberculosis, and uremia. Also called acute respiratory distress syndrome, congestive atelectasis, hemorrhagic lung, noncardiogenic pulmonary edema, pump lung, shock lung, stiff lung, wet lung. observations Signs and symptoms include dyspnea, tachypnea, adventitious breath sounds, hypoxemia, and decreased lung compliance. Changes occurring within the lung include damage to the alveolar-capillary membranes, leakage of plasma proteins into the alveoli, dilution of surfactant, cessation of surfactant production, hemorrhage, interstitial edema, impaired gas exchange, and ventilation-perfusion defects. interventions Treatment includes establishing an airway, administering oxygen, improving the underlying condition, removing the cause of ARDS, suctioning the respiratory passages as necessary, and reducing oxygen consumption. When ventilation cannot be maintained and there is evidence of a rising partial pressure of carbon dioxide in arterial blood, mechanical ventilation is necessary. Positive end-expiratory pressure (PEEP) is widely used in the treatment of ARDS. All interventions for ARDS are supportive; there is no cure. nursing considerations The patient with ARDS requires constant and meticulous care, reassurance, and observation for changes in respiratory function and adequacy, including signs of hypercapnia, hypoxemia (especially confusion), skin flushing, and behavior changes such as agitation and restlessness. Increasing hypoxia may be signaled by tachycardia, elevated blood pressure, increased peripheral resistance, and fulminating respiratory failure. If PEEP is being used, the patient is carefully observed for a sudden disappearance of breath sounds accompanied by signs of respiratory distress-an indication that pneumothorax may be present. Respiratory therapy, sterile suction techniques, and position changes are continued as necessary. The patient's weight is measured frequently, chest x-ray films are evaluated, and bacteriological cultures of secretions are analyzed for the causative organism. Throughout treatment, ventilation is carefully monitored through analysis of arterial blood gases. ARDS has a 50% mortality rate. A condition due to a diffuse infiltrative process in the lungs, which affects ±150,000/year (US), and is characterised by acute pulmonary oedema and respiratory failure, poor oxygenation, increased functional residual capacity and decreased compliance; ARDS may accompany various medical and surgical conditions, and may be associated with interstitial pneumonitis—usual, desquamative and lymphoid types. Gram-negative sepsis, pneumonia, shock, gastric acid aspiration, trauma, drug overdose, toxic gas (chlorine, NO2, smoke) exposure, severe metabolic derangement, pancreatitis. A 6–24-hour latency period is followed by hypoxia, decreased aeration, dyspnoea, severe SOB and “stiff” lungs—i.e., decreased pulmonary compliance. Extensive, diffuse bilateral fluffy infiltrates. Nitric oxide (NO), 18 ppm, may reduce mean pulmonary artery pressure; 37 to 30 mm Hg, may reduce intrapulmonary shunting (36% to 31%), increase ratio of partial pressure of arterial O2 to inspired O2 (PaO2/FiO2), an index of arterial oxygenation efficiency (±152 to ±199); other management strategies include PEEP. The outcome of ARDS is a function of underlying cause. ± 60%, the cause of death has shifted from hypoxia to multiple organ failure. Disorder with rapid onset of progressive malfunction of the lungs usually associated with malfunction of other organs attributable to inability to take in oxygen. Condition is associated with extensive injury to the alveolar capillary membrane, lung inflammation, and small blood vessel injury in affected organs. Synonym(s): acute respiratory distress syndrome, wet lung (2) , white lung. A severe form of failure of lung function in which the tiny air sacs are damaged and become flooded with a fluid containing protein. There is severe breathlessness and a dangerous reduction in the supply of oxygen to the blood.